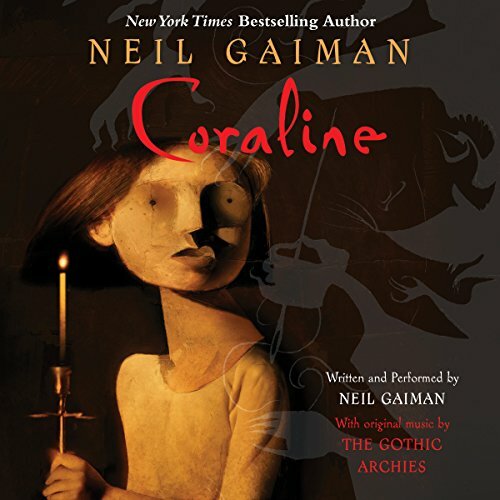 I’ve had Coraline on my Audible account for a while and was in the mood for a quick listen. Probably could’ve finished it in one sitting, but you know how life gets in the way. Coraline and her parents have just moved into a new home that has been converted into flats. Along with the new home are new neighbors, all just as interesting as the next. But the most curious thing is a door that leads to nowhere except for a brick wall. At least, that is until one day when she opens the door and finds a passage to another flat very much like her own. Of course, that can’t be true, right? Everything here is better: the food, the toys, and even… her parents? Another mother and another father are here, very similar to her own parents, but with buttons for eyes and very pale skin. Unlike her parents, they aren’t too busy for her and give her the attention she craves. They seem too good to be true, and they are, as they want to change Coraline and never let her leave. Turns out, the other mother has trapped other children here as well and Coraline is their only means of escape. She will have to ask for help from some of the most unlikely of friends in order to free not only them, but herself. I very much enjoyed this little story, especially the audiobook narrated by the author himself. It is always a nice touch with the author can give each character its intended voice and set the tone exactly how it it was meant to be presented. Coraline is a very likable character and one you can truly sympathize with, whether you are a child or an adult. Her situation is very similar to that of Alice in Carroll’s classic, but the overall sense of dread that hangs over her head leads to a darker path to the light. The tale is genuinely a creepy one and, in my opinion, Gaiman is to books like Tim Burton is to movies. If you are a fan of either, I would suggest picking up Coraline and giving it a read. If reading or listening isn’t your thing, you can watch the movie by Henry Selick (The Nightmare Before Christmas / James and the Giant Peach) that came out in 2009. Run time is about 1 hour and 40 minutes.